Surprise your family with juicy and tender meat, cooked with love. It can be consumed as a separate dish, add to the first dishes or used in salads. Cook delicious meat, is very simple. Rinse well with a piece of fresh meat under running cold water. Remove any excess fat. Pour clean cold water into the pot. The amount of water should be small, to cover the meat. Bring to a boil. Dip the meat in boiling water. All the prepared piece should be omitted entirely, cut it is not necessary. That the meat was not only delicious but also safe, wait until the water in the meat boils. Then remove the meat. Drain the water. Bring to boil a new batch of clean water. Again, lower meat. Depending on the type of meat, calculate the cooking time. Pork boil for about 50 minutes after boiling, chicken about 30-40 minutes, beef about 1.5 hours. Do not forget that the cooking time depends on the age of the animal. Therefore, if having a slice of not very young specimens, the cooking time should be increased. As soon as the water in the meat boils, immediately reduce the heat. Add salt to taste. Less will boil the broth, the more nutrients will remain. Meat should be simmering on the fire, and always with the lid closed. To add flavor to cooked meat in 15 minutes after boiling, add the head of garlic or an onion, Bay leaf, black pepper and a sprig of rosemary if you have it. During the cooking of meat requires several times to turn in the pan with a fork to evenly roasted. At the end of cooking turn off the heat, leave the meat to rest for 10-15 minutes to infuse. Put the meat on a platter and cut into serving pieces, add favorite herbs. You will be surprised by the tenderness and juiciness of cooked meat. Bon appetit! 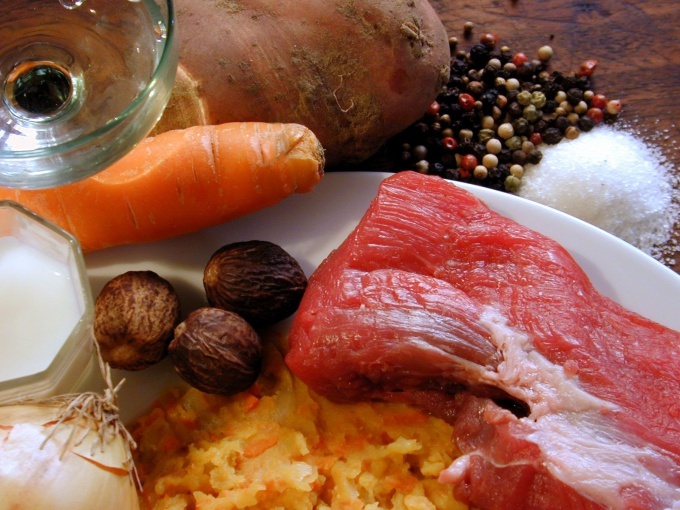 Merging the first broth is necessary to remove any undesirable substances that could get into the meat in the process of fattening up the animal. The taste quality of cooked meat depends largely on its freshness. Better to take a piece with bone.